The American Film Institute in Los Angeles, California, in mid-June 2000 selected America's 100 Funniest Movies with a blue-ribbon panel or "jury" of more than 1,800 leaders of the American movie community including actors, directors, screenwriters, editors, cinematographers, historians, film executives and critics. 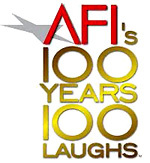 AFI's 100 Years...100 Laughs revealed America's 100 funniest movies from a ballot of 500 nominated movies. According to the AFI, these are "the films and film artists that have made audiences laugh throughout the century."